You didn’t think I forgot part 2 for this crutch word, did you? In case you missed part 1 you can find it here. When we draft our stories, we want to get them out as fast as possible. Which tends to make things sloppy and messy. Non-writers, don’t get us wrong. It’s a need all writers have; get the story out of our heads immediately. Unfortunately, this comes at a price. When we finish our first draft, we haven’t exactly “written” anything. Technically, we have, but practically, well… it’s not readable. When we draft a story, what we’re really doing is putting our thoughts down. Writing comes after we’re finished with the first draft. That’s when we have to turn our drafts into something that won’t hurt the eyes (or the minds) of our readers. Part of this process involves removing crutch words. One such crutch word is the past tense of the verb go (went). We love using it (and other crutch words), because it’s always available and it does the job. The thing is, readers want more than a word that just does the job. The problem with went is that it’s not descriptive enough. And so, we have a huge list of synonyms to consider. 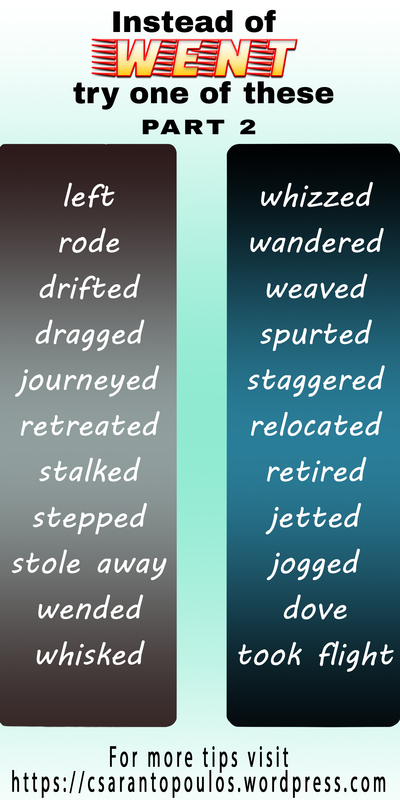 Below, is a small list of some of the available synonyms for WENT. Keep in mind that every synonym has a meaning of its own, so make sure you use the right word. And yes, I know there are more synonyms available. I will cover those in future posts. This entry was posted in Advice, Uncategorized and tagged advice, creative writing, editing, editors, edits, novel problems, novel writing, revisions, synonyms, writing, writing advice, writing problems, writing tips. Bookmark the permalink. I think writers all have different crutch words. Went isn’t one of mine. I don’t believe I use that very often. More true for me would words like that, be, was, and after. Thanks, Chris. I’m in the editing stage so this is very helpful! Mine too. I have a series of macros I use that are tasked to highlight all the words you mentioned, except after. I haven’t noticed that as a problem in my writing. Hmmm… Maybe I should.